We were founded with the mission to find you lingerie that fits perfectly and feel comfortable, with no straps cutting into you, no gaping and no pinching. It should make you look and feel comfortable, confident and beautiful. We've done all the will fit you no matter your body type or style. Many women have trouble finding the perfect bra, and although we can give you some useful tips, you should still try on lingerie to be sure it fits correctly. We recommend that, although we sell our lingerie online, our online clients treat themselves to the in-store Rigby & Peller Lingerie Styling experience where they will be correctly styled and fit by one of our professional Lingerie Stylists. Ideally, this should sit flat on your chest, directly on the skin, without digging in or feeling too loose. 2. HOW DOES THE WIRE SIT? Follow the wire with your finger: it should be sitting closely, but comfortably around your bust to give you the best fit. If it is sitting directly on your breast tissue or stands away from your bust, the cup is too small and you should try one or two cup sizes up. Similarly, if the wire is loose, try moving down a cup size. If you notice the cups digging into the breast or any wrinkling around the cup, the size is likely to be incorrect. Your breasts should be fully encased creating a smooth, clean silhouette. 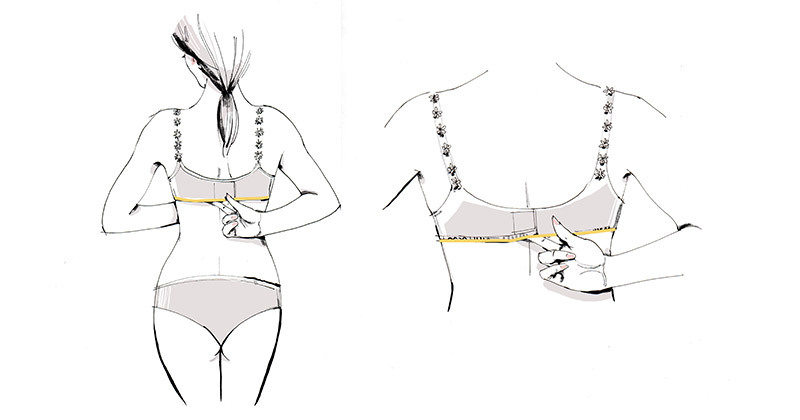 Assessing the fit of the cups is best done with a non-padded bra. Fasten your bra on the middle hook. If the back rides up and isn’t sitting horizontally, the band size is likely too loose and you should try going down a size bracket. Ideally, you should be able to comfortably fit two fingers under the fastening of the band at the back. If more than two fingers fit, the band is too loose. Similarly, if fitting two fingers is difficult, the band is too tight. Note that if you go down in the back, you will need to go up in the cup to compensate. For example if a 34C cup is loose, try a 32D cup. 5. FINALLY, ADJUST THE STRAPS.. These should sit firmly on the shoulder without digging in or leaving marks and indentations. 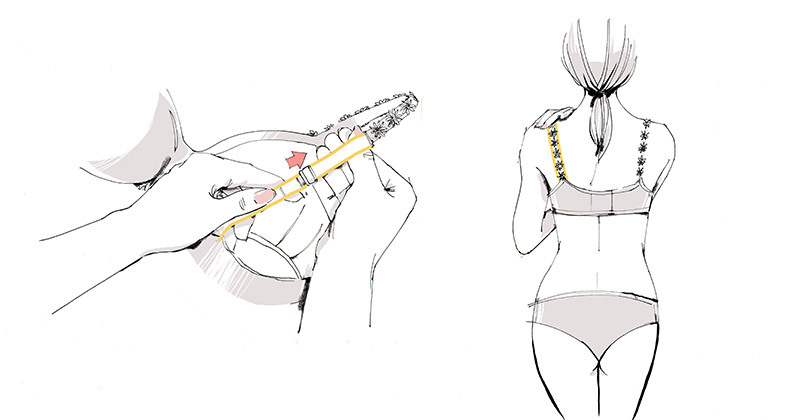 Straps help to balance the weight of your breasts with the main support coming from the band. Let our expert Lingerie Stylist help you find your perfect style and fit and a boutique.